The rising costs of healthcare in DoD have placed a spotlight on the importance of sound management of DoD’s Military Treatment Facilities (MTFs) in recent years. Whitley’s report finds that the direct care system’s central role in DoD’s readiness and beneficiary missions means that ensuring effectiveness and efficiency in care delivery is vital for accomplishing defense mission goals. The direct care system provides an “operating base” for the military medical community, and flexibility for rapidly transitioning and deploying personnel. However, the system faces growing challenges that hinder effectiveness in delivering on its mission—challenges that include utility for readiness and high cost, which are the focus of Whitley’s report. A third challenge identified but not detailed in this report involves the quality of care and care experience attributes, such as wait times and access. This report presents background information on the challenges of the direct system to provide context for the modernization reforms directed by the NDAA. Whitley describes specific actions DoD can take to improve performance and reduce costs in MTFs. This includes, where applicable, illustration of examples where DoD has already taken these actions in a limited fashion or in other areas of the department. Many of the recommended actions have been implemented on limited scales (or in other mission areas). It also draws lessons learned from these experiences for reform across other government healthcare delivery systems. The actions identified in Whitley’s report start with clear articulation of the mission of a facility. Congress has provided direction for facilities in section 703 of the FY 2017 NDAA, giving DoD a useful starting point to organize and unify its modernization efforts. Data driven management, along with leadership and operational management reform, are both directed by Congress and basic elements of modernization. Finally, public-private partnerships are essential; DoD cannot execute reform alone and the private sector brings a wealth of knowledge and experience (in addition to patient base) that could be leveraged to modernize military hospitals. 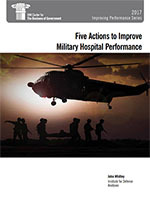 We hope that Dr. Whitley’s insightful report will help efforts of military healthcare leaders to improve military hospital performance. Modernizing DoD’s direct care system benefits national security, military service members and the taxpayer—and can be done in a way that also helps to improve civilian care across the country.